Click on the The Animal Rescue Site to give food to an animal in a shelter at no cost to you. Happy New Year! 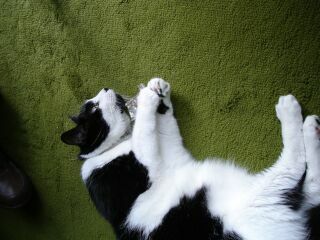 Here I am, sort of celebrating, although neither the catnip nor the toy mice made it into the photo. Last year's photo is a bit less staid, and it made it into the 2011 calendar (although not for December of January). We received a few other calendars this year, including one from Barx Bros, that has wonderful drawings of cats and dogs. This company handles client communications for animal care professionals, but their catalogue contains some delightful fun stuff. There's a t-shirt showing a love cat sitting on top of a computer, with the words Original Laptop, and one which changes the nine lives saying around, so that it reads: Every life should have nine cats. Of course there are nine different cat portraits on the front. Bobbi and I received a whole set of cat-themed note pads for Christmas, and she's teaching me how to hold a pen so I can use them. 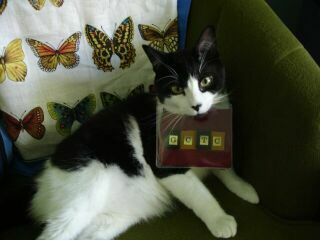 We also received a cat bookmark and she will soon be wearing a tiny black cat pendant her niece sent for her birthday. Merry Christmas! Our pal Dexter sent a photo of the Christmas tree which he's guarding. 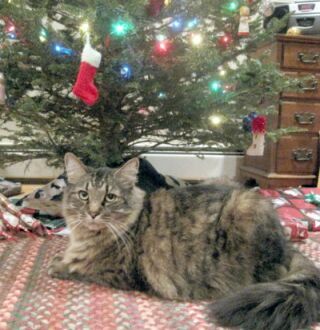 Lily, the youngest members of our MEWSical Society, poses in front of her tree. Lily has been cast as Tinker Bell in our new virtual production of Peter Pan. You may not know that Bobbi has a birthday two days before Christmas. It turned out to be a busy day, as one of her former students at The Latin School of Chicago told the alumni group and a bunch of them sent email greetings. She also received some long-distance phone calls, and the three children from across the street came over to deliver a card, gift, and cookies. No catnip, alas, although they did bring me a wonderful new toy earlier in the week, when they had their musical Christmas party here. I've been sitting in on their piano lessons, and plan to try playing a scale (remembering to put my thumb under!) one of these days. I have six toes on each paw, so that shouldn't be difficult. Bobbi has been out a lot this week, so I'm hoping we'll spend next week enjoying some play time together. I know there are new toys in my Christmas stocking, and I heard to tell someone on the phone that she bought another new one for me which is still in the car. Evidently, it won't fit in my stocking, so I'm really curious! Meanwhile, I'm trying to figure out what to do to help her celebrate her birthday, which comes just two days before Christmas. What an awkward time. She's been receiving birthday cards along with Christmas cards, and I find it all a bit daunting. I've decided I'll use My Calendar as my gift to her. I know I didn't do this myself, but I did give Iris permission to use My Photos! I have the Most Exciting News! Superbly talented artist/photographer Iris Ten Holder has created a calendar for me, using photos from our website. She's selling it from her website, at www.ottawaphoto.com. You can see the cover at the right. The 12 photos for each month were taken by Bobbi, but this cover photo was taken by Debra Hulley, at my 3rd birthday, when I performed all my tricks for a large audience, including many people I've never seen before. That's Bobbi, holding a treat in her hand as I obey her command to "leave it there" until she tells me I can have it. We just found out that Bobbi is this year's winner of the Shojai Mentoring Award, presented at the international conference of the Cat Writers' Association. The award consists of a plaque and $500. 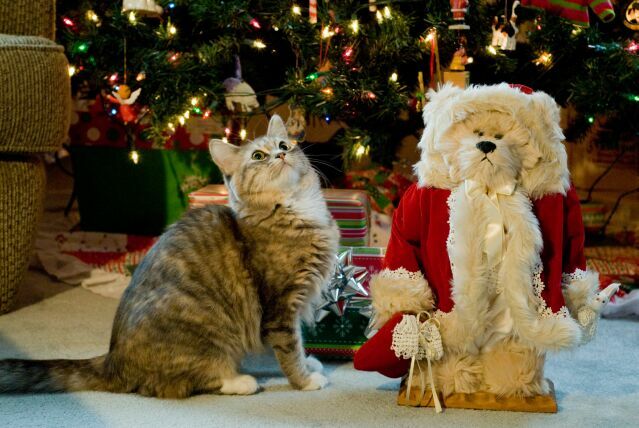 As soon as it arrives, I will ispect it carefully for Traces of Catnip, and then help Bobbi decide where to hang it. And I'll get her to post a photo here. Meanwhile, I have to find out if there's an award for Wise Cats who mentor other kitties. 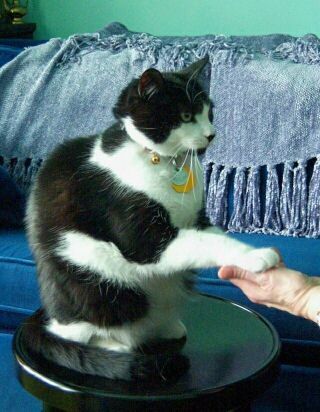 I know my pal Tyler would nominate me, and members of my MEWSical Society and my Fan Club would certainly vote for me. 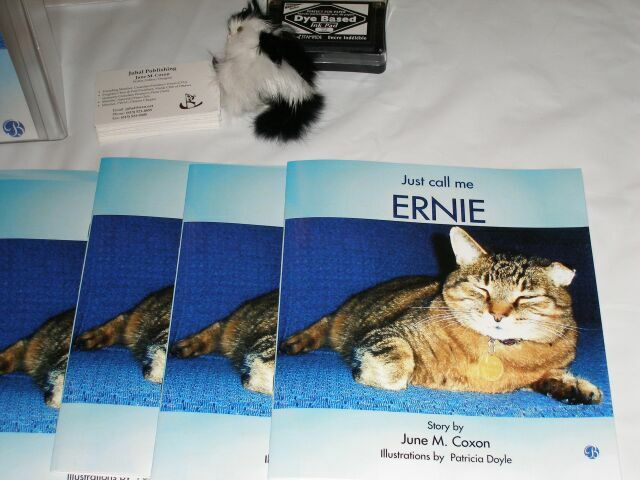 Meant to tell you that Tyler's mom took the book he helped her write (Just Call Me Ernie) along with Mewsings/Musings to The Ottawa Authors & Artisans Fair last month. Bobbi keeps coming home smelling of DOG! Last Sunday, it was Radar, the golden retriever who played Sandy in the delightful Orpheus production of Annie. A Master Obedience Champion and Agility Dog who competed in Canada and the U.S., Radar is now 11, retired from competition but still active as a Therapy Dog. Bobbi saw him as he emerged from backstage after the show, and got to pet him. Then yesterday she signed copies of Mewsings/Musings and Five Fast Steps to Better Writing at Books on Beechwood in Ottawa. Antoinette, who works there, brings her miniature poodle, Teacup, to the store, where he greets everyone. 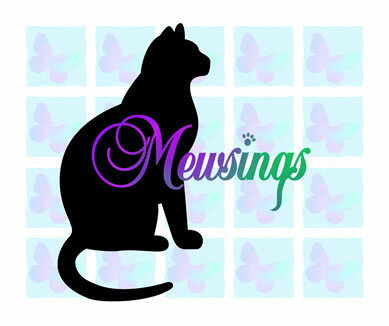 Bobbi took copies of Mewsings/Musings to a new "exclusive boutique for cats" in Ottawa yesterday. She returned home with several long grey hairs from the store's resident feline, Mookie, who spends every day at the store greeting visitors and demonstrating the furry beds and elaborate cat condos they carry. The Cats R Us website has music, pictures of many of the featured products, and a page on their cat-sitting service. Speaking of cats and books, the first book about Dewey, The Library Cat, sold over 2 million copies, has been translated into dozens of languages including Sanskrit. Author Vicky Myron said she never imagined that the small fluffy and scared kitten they found in the book shute one frigid morning would touch so many lives. She's heard from people all around the world, and people often stopped in Spencer, Iowa, when Dewey was alive just to meet him. Others still come to see his memorial. 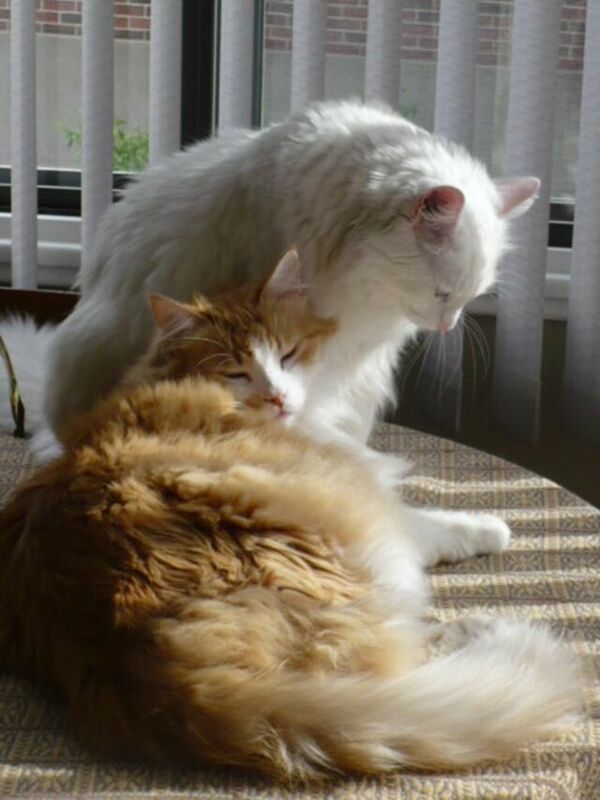 In 2009, the library adoped Dewey's successor, an orange and white tabby stray found by the side of a snow-covered road. If you search the web, you can find videos of Dewey, and hear about the movie to be made about him, starring Meryl Streep. We had some excitement here this week. A Big Truck pulled up in front of our house before we were even out of bed. Two men got out and brought Big Ladders into our back yard with ropes and a Chain Saw. I'd heard that noise before, when these same men were cutting parts of the tree in the yard behind us, but now there were here, attacking Our Maple Tree! Bobbi assured me this was a Good Idea, because a lot of small branches have been falling from that tree every time we have a windy day. But I was worried about My Squirrel Pals who nest there, and their Bird Feeder that the cardinals also enjoy. Fortunately, the top of the tree is fine, and somebody told me the squirrels will use leaves still on the ground to build a new nest before it gets too cold. And the Bird Feeder is going back up this afternoon. Yesterday was my annual check-up with Dr. Dan. I really like him, but hate the ride in the car to get there. However, when we arrived, there was a dog to greet me! Bailey is a cream and tan American cocker spaniel who lives with two cats (one of whom he "adopted" and cares for after his owners rescued an abandoned kitten). Dr. Dan was pleased that I lost half a pound in the past year. That's because I'm on a grain-free diet which contains 40% protein, and also because I've been exercising! 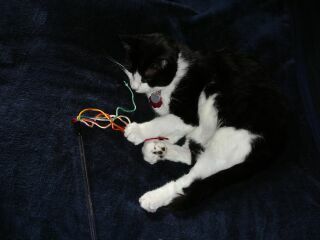 I won a ribbon wand in contest sponsored by The Inside Scoop, a great newsletter from Dusty Rainbolt, who reviews all kinds of cat products for Catnip. 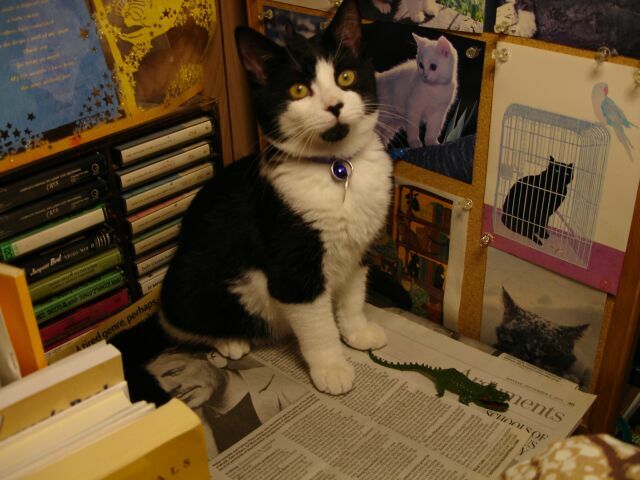 Speaking of veterinarians, Dr. Susan Little was the vet Bobbi first took me to when I was just a tiny kitten. That was four years ago, and I now go to Dr. Dan, who lives closer to us, but I still remember Susan and how she had a special way of handling cats. So imagine my delight when I saw her on TV earlier this week! She was on a segement of Global National News at 6pm and they called her the cat whisperer! One thing the announcer mentioned when introducing Susan was that there are 8.7 million cats in Canada. Happy Hallowe'en! I'm going as a leopard this year. This light-hearted holiday also has a serious side, as many animal shelters need funds to help them survive through the winter. Our friend, Debra White, volunteers at The Arizona Animal Welfare League, the largest and oldest no-kill shelter in Arizona. They try to keep the large population in the cattery comfortable and happy until permanent homes are found. Someone recently built a couple of kitty condos the cats just adore. Debra is one of the shelter's "match-makers" who help visitors find the right cat to join their household. The cat adoption page contains names, birth dates, and detailed info about many of the cats, and every week one cat is chosen to be the "volunteer pick." We think all shelters should operate this way. Recently they participated in the annual Bowl a Rama which raised more than $200,000. 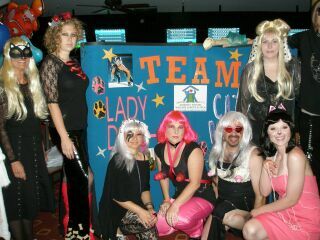 The AAWL group won best costume, dressed in "Lady Doga" outfits. Each group that participates in this event keeps the money they raise for their own work in the rescue field. The Phoenix Animal Care Coalition raised $40,000 for their Emergency Medical Fund, which all the groups in the coalition can tap for veterinary bills. 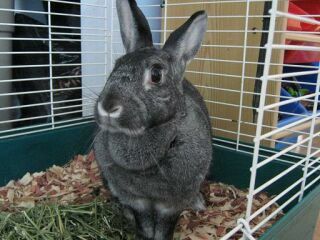 Today is the fourth anniversary of my adoption from the Ottawa Humane Society. I'd been there just a few weeks, and was about 10 weeks old when Bobbi took me home. So it's fitting that I am the special cat for Oct. 28 in The Cat-lovers Book of Days. One would think that if a Lady Who Shares the Office of a Very Famous Cat left him alone for Four Whole Days, she would have brought back a Significant Present to compensate. But the suitcase has been emptied, and not a single Toy or Treat was tucked inside. Meanwhile, I had to take Every Single Toy out of all the baskets around the house in order to amuse myself while she was gone. Fortunately, Laura came over and helped me prepare for Hallowe'en. I'm late writing my blog this week because Bobbi was in Toronto attending a Moslem/Hindu wedding over the weekend, and she shut down the computer before she left. I know how to use the keyboard, but not how to turn the computer on. Have to figure that out so this doesn't happen again! Meanwhile, we're getting ready for Hallowe'en. I have some great photos to post from a fund-raiser held last summer by some pals of mine in Arizona. Volunteers dressed up in "Lady Dog" costumes, and raised lots of money. I'll send those next week. I received a long letter from Tyler (a member of my MEWSical Society) and posted that, along with my reply, on Tyler's page. We discuss vet visits, having claws clipped, and holidays, among other things. We also had a report from An Unknown Source about one of our dog pals. DUH (Poochino Spitt (aka Der Uberhund) turns out to be a typical female in that she adores shoes. We hear that she often sneaks shoes out of the house (head down, so her humans don't notice) and takes them out to the middle of the lawn and leaves them there like trophies. News this week is that Orpheus is casting their winter production, Sondheim's Into the Woods. I'm an Angel whose name appears in all the Orpheus programs, but I've never appeared in a production. They didn't ask me to audition for the dog in their current show, Annie, although I tried to persuade the director that it might be better for Annie to adopt a stray cat rather than a stray dog. In any case, I see there's a non-speaking, non-singing role in Into the Woods. It's Milky White, a dancing cow. I'm trying to decide whether or not I want to commit to more than six weeks of rehearsals. I also don't think I should have to audition. Don't you think they should make an exception for Yours Truly, a Furry Angel? I just heard that the The Phoenix Animal Care Coalition is having a photo contest for a wine series they will sell to benefit homeless animals. Six pets will be selected to be on the new labels. The $10 entry fee also goes to the animals. Go to www.pacc911.org for details about how to enter. PACC and other rescue groups partner with Charity Wines for this venture and it has been successful for those involved. I'll be telling you more about PACC later in the month, as we know a great volunteer who works there. I sent Bobbi to Britton's book and magazine shop in Ottawa this afternoon, to sign copies of our books (Mewsings/Musings and Five Fast Steps to Better Writing). It was cool and rainy, so I opted to stay home and nap. That's one of the advantages of Being a Cat! Ted Britton is a great guy. A political science graduate who took over his parents' store after his father died, Ted has become an institution in the neighborhood. He carries a huge selection of newspapers from all over the world, magazines of every type, and a wonderful selection of books. Bobbi's speech to the agm of Ottawa Lifelong Learning last Tuesday generated quite a few giggles. I don't understand what's so funny about the tale of how Simon Teakettle took over her life and her career! 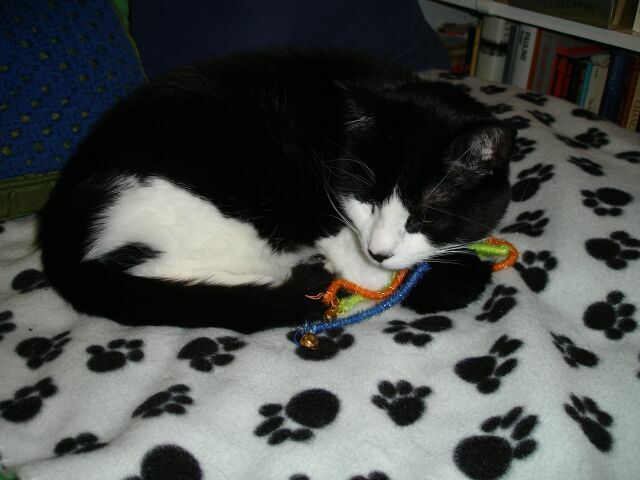 We've just added our 27th cat to the Fan Page. We also keep adding to Cat Facts, including this new tidbit from catchannel.com: Dr. Elizabeth Devitt, DVM, in an article on cat color, describes the black and white cat as born to be an ambassador. There is always a black and white cat in residence at 20 Downing Street, residence of the British Prime Minister. September is Happy Cat Month, and I'm doing my best to celebrate. My dear friend, Dusty Rainbolt, who writes product reviews for Catnip (the newsletter from the The Cummings School of Veterinary Medicine at Tufts University) has started her own newsletter, called The Inside Scoop. They had a contest, with I won (!) and I'm awaiting my prize, a special feather toy. When it arrives, I'll have Bobbi take a photo to post in a subsequent blog. Meanwhile, our new laser printer was installed last evening, the inkjet has gone downstairs, and the oldest printer and fax machine are being donated to The Ottawa Mission. Last year 50 people studied in their Learning Centre, 223 new clients were helped to find employment and education, 332 people were helped to find housing, and 414,174 meals were served to the hungry. It's one of the charities we support. I'm sorry I didn't think to write this self-help book for cats, because it answers all the questions I've been wondering about since I first arrived four years ago. Who are we? Why are we here? Where are you going with that ham? Filled with quizzes, exercises and insider tips, this indispensable guide empowers cats to make the twenty minutes theyre awake each day the best twenty minutes of their lives. I particularly like the chapter called Dont Sweat the Small Stuff&ldots; But Feel Free to Freak Out Over Anything That Moves Suddenly or Without Warning. This book is now on our Favorite Cat Books page. Ottawa Independent Writers held their summer social yesterday, at a local restaurant where they had a private room. That was ideal for members to read from their work between courses. I persuaded Bobbi to read Grow Your Own Fur Coat from MEWSings/Musings, and she said it got quite a few laughs. She stopped en route at a local store where they had Fancy Feast on sale, so I was delighted to see all those little cans being put away in the hall closet (where she also keeps the catnip!). It looks as if there will be enough to keep me satisfied through the winter. Like squirrels, we have to lay in supplies before the weather closes in! My Fan Club is growing every week. There are now 25 cats, 9 dogs, 2 birds, 2 alpacas, 1 llama and a rabbit, and I've been told two dogs and a cat from Spokane will be joining soon. Did I ever tell you that we have a piano in our living room? You've seen me with my drums, but probably didn't realize that they reside beside the piano. This is a house filled with music, and I'm learning to play the piano as Bobbi teaches the children across the street. I'm paying careful attention so I can see if my six-toed paws can hit all the keys in order. 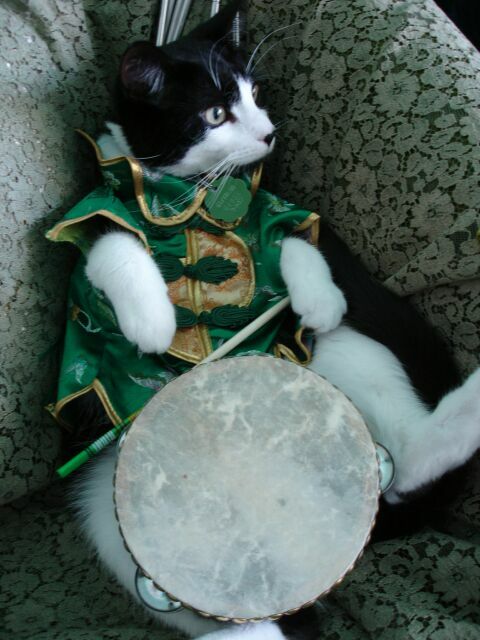 If that doesn't work, I'll accompany them on my drums, tambourines, and chimes. Bobbi has borrowed these from me to teach the children rhythm and time signatures. Do you play with your food? I just read that cats consider their food and water bowls to be safe places to hide prey (i.e. toys). Not me! I root through my dry food dish and toss out the ones I don't like as much, rather than putting anything into the bowl. Bobbi is pretty dense; she still hasn't gotten the message that I prefer two of the three different dry foods she's mixing together. Tulip (a member of my MEWSical Society) was adopted after the death of a lovely black female who had strange eating habits. Marlene used to scoop water out of her bowl to drink it. Maybe she didn't want to get her whiskers wet! Tuffous (another Society member) likes to communicate. When he's annoyed about something, he walks around making short, voiced purrs. And one day, when he realized he was eating from the wrong bowl, he made a sound like "oh!" and went over to the other bowl. We don't know my actual birthday, but Bobbi decided to celebrate it yesterday. The children brought me cards and little gifts, and helped set up a tunnel Bobbi bought for me. 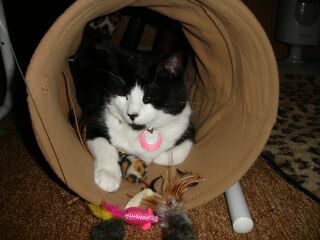 The only photo of me exploring the tunnel is not very flattering (all you see is my rear and tail!) so I'll have to ask her to take a few more. We're gearing up for National Dance Day, which takes place all over North America on July 31st. Sponsored by the Dizzy Feet Foundation, this doesn't actually involve cats, but we think it should, and we're lobbying for feline terpsichorian exhibitions to complement the human ones. Meanwhile, our favorite human percussion group, NEXUS, is playing a concert that evening in Woodstock, NY, and then they're off to Japan for concerts there. We have several talented choreographers in our MEWSical Society, and they'll soon be busy working on our new Virtual Productions, Peter Pan and Snow White. I've been exchanging e-mails with other members of my MEWSical Society about how animals communicate. This started with an article in the NYTimes about how babies learn language, and Pookie & Tuffous said they recognized many words, as I do, without any hand signals to provide clues to their meaning. Among the words many of my Society members recognize are those related to prey or food: bird, mouse, catnip, treats. I will come running if Bobbi says the word brush, and of course I respond to food. She refuses to put the dish down for me unless I obey her command, Sit by your tray. And since I have to sit for so many things, that's a word I react to immediately. We're working on Stay. I'm getting pretty good about that, but not ALL the time! Willow (a member of my MEWSical Society who lives in Edmonton, Alberta) wrote to say that she enjoys sitting in the front door watching fledgling magpies walk up her sidewalk. They are really cute with their fuzzy black heads, but they drive me crazy when they spend hours practicing their voices. Then I need earplugs. She continues: I watch the robins too, and any kind of bird that hops around outside. Sometimes I see a squirrel run across the sidewalk to another tree. What really gets to me are two cats that come right up to the step and look at me. Believe me, I give them a piece of my mind. I think it's really rude of them to come on my property, especially when I am sitting right there warning them. The sun shines in that door all morning, and I have some of my best sleeps sprawled out there. I hate it when Elizabeth goes out because then she closes the wooden door, even though I'd be happy to stay there keeping guard. I agree completely, but I never sleep in our doorway. There's just too much to watch outside. Our squirrels are in the back yard, so I can see them from two favorite windows which face the maple tree where their feeder hangs. We just posted some fascinating information about squirrels linked to the Animal Facts page. Go HERE to find out about more than you probably ever wanted to know about squirrels. Did you know that I get to celebrate two holidays this weekend? 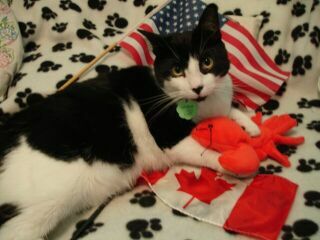 We observe Canada Day on July 1st, because that's where we live, and I'm a Canadian citizen (Feline Variety). But Bobbi was born in Connecticut, and she's still an American citizen, so we celebrate the Fourth of July as well. Fireworks! And yes, that's a lobster in my paws. I'm sure you heard about our earthquake, as it was reported not only in Canada but on CNN. I must admit I didn't feel much, as I was asleep on the waterbed when the house started to shake. A few things fell down, but only one broke (it wasn't anything important, but I was warned to stay away from the glass until Bobbi cleaned it up). What excitement! We only get one of these every decade or so, since we're on a major fault line, but Bobbi said this one was accompanied by a deep rumble (which I thought was just a heavy truck going by) and vigorous shaking for longer than any previous quake she's experienced here. We do have a quake story from 2003, when the huge and terrible tsunami hit Southeast Asia. Evidently, when something that big happens deep in the earth, all the plates move, and Tiki was one of many cats who reacted far away from the actual event. He was included in an article, "Can Cats Predict Earthquakes?" in Cat Fancy. You know that I'm a great patron of the arts. The first Simon Teakettle started that tradition, supporting the Orpheus Musical Theatre Society for many years, and the Great Canadian Theatre Company from its very early days. Orpheus is now in its 104th year, and GCTC is just completing its 35th season. Bobbi attended the final productions of both companies this month, along with a couple of other local MEWSical Society moms. They all loved The Producers at Orpheus and Heroes at GCTC, both of which received rave reviews in the media. One of the three actors in Heroes is our MEWSical Society's own fight director, the wonderful John Koensgen. Last Wednesday, Bobbi got together for dinner with two of the Ladies whose cats are in my MEWSical Society, and they shared many cat stories. Tulip Adams, it seems, continues to Get Into Trouble, although her Table Manners have improved somewhat. The Foss trio, on the other hand, tend to blame each other whenever some Naughtiness is discovered. They might all benefit from reading Cat Confessions, a "tell all" book complete with photos of the misbehaving felines who provided the quotes. Flash, for example, explains the Case of the Missing Shrimp by inventing a terrific story about aliens who flew into the kitchen, while Ham, Shem and Japheth confess that they "lick the salt off the potato chips when Mommy has company." June is Adopt-a-Cat Month. One of our pals, Steve Dale, award-winning pet columnist and broadcaster (whose cat is a member of my MEWSical Society), is involved with two organizations that just published CATegorical Care: An Owner's Guide to America's Number One Companion. It's free from the websites of both the American Humane Society and the CATalyst Council. Bobbi was on Steve's popular radio show two years ago, when she was visiting Chicago. She and another guest talked with Steve about feral cats. We have info about ferals on our Cat Facts page. Bobbi is always adding to that, so check it every so often. A friend of ours, who came to my First Birthday Party in a car decorated Just For Me, has embarked on an interesting New Venture. Her cats have joined my Fan Club, and I wanted to tell you about her unique gifts. Shannon Lee Mannion was a columnist for many years with a variety of daily and monthly publications. When she stopped using the computer keyboard to earn a living, she did an about-face and started to turn computer keyboards into art, Pop Art, that is. Riffing on the QWERTY designation for standard keyboards, typewriter and computer, she calls her creations, Quirky B's. For more information and to follow her success as a Pop artist, please go to www.quirkybs.blogspot.com or www.slmannion.com. She's also on Facebook. Bobbi snapped a photo as I was showing Tazi my new denim vest. 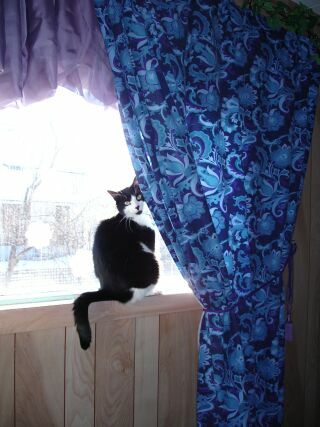 I won't be wearing it out of the house, because I'm strictly an Indoor Cat, although I've enjoyed the wonderful weather we've had all spring because Bobbi leaves the front door open, where I have a little stool where I can see out the full screened panel. If you've been following Tyler's letters to me, you'll see he wrote about going Outside. I don't think he has a denim vest, though! If you're looking for a wonderful website, check out the new store in Ottawa that's carrying Mewsings/Musings. The site has lovely graphics and will soon announce where the store is moving (probably still within Carlingwood Shopping Centre). The store is called Cats R Us. Ottawa is in the midst of one of the best Tulip Festivals this city has ever hosted. The early warm weather forced the bulbs into bloom earlier than usual, and since it was followed by a cool spell, they've remained in glory. Because it's the 65th anniversary of the liberation of Holland, accomplished primarily by Canadian soldiers, Princess Margriet, who was born in Ottawa when her mother, the Queen, took shelter here during the occupation, is visiting this week. The number of tulips Holland has given to Ottawa over the years has now multiplied so there are now an estimated 500,000 in bloom across the city. What a glorious sight! Part of the Tulip Festival is a series of celebrity speakers, and among them this year is Italian scholar Lamberto Tassinari, who claims Shakespeare's plays were actually written by John Florio, from whom Bobbi's father's family is supposedly descended. Read about The Florio Connection HERE. Cats don't celebrate Mother's Day. But that doesn't mean we don't remember our mommies. Those first few weeks with Mom are very important, which is why it's always a mistake to take a kitten away from his mother until he's at least 8 weeks old. I think the reason why I'm afraid to go in the car dates back to when I was taken from my mom and siblings and brought to the Ottawa Humane Society, where I was in a small steel cage, all by myself, until Bobbi came to adopt me. We did have a very brief car ride last week, but I kept both paws on Bobbi's arm all the time, although I did sit in my open carrier, where I was securely fastened with a special belt. Pets need seatbelts, too! It's not safe to drive with a cat or dog in the car unless they're restrained so that they can't fly off the seat if you stop suddenly or have an accident. I finally got Bobbi to take a photo of my Benjamin cards, now that I've received all ten in the series. You can see them here, hanging beside the closet door. 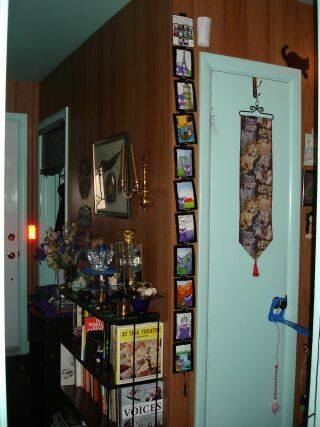 On the door knob are a couple of my dangly toys, hanging from a blue plastic hook. I always take a quick bat or two as I walk by. Somebody just accused me of being Spoiled. That's not true! It may appear that way because I have Three litter boxes, Four scratching boards, and Toys All Over the House, but I'm actually a very Polite kitty! I come when I'm called, have to Sit Beside My Tray before Bobbi will fill my food dish, and don't climb on top of Places Where I Don't Belong. Those include countertops, tables, and One Special Chair in the living room. I do lots of tricks, which include giving first one paw and then the other, leaving my paw on her palm withe at treat, until she says I can have it, touching a treat with my paw when it's on a small tray, and leaving my paw on a special mouse while she holds a treat in her hand. I do get rewarded, however, in many ways. One is with massage, which makes me purr so loud I'm sure the neighbors can hear me. Bobbi follows the method described by her friend, Maryjean Ballner. Her cat massage DVDs are very popular, and she's even appeared on the David Letterman show! Send your People to: www.catmassage.com, so they can learn how to do this, too. Sometimes, however, I have to Assert Myself. I lost the argument about the "Frenchie" chair in the living room, but I'm still insisting that All Stools belong to Yours Truly. That seems to be fine with Bobbi, except for the bathroom stool, which she claims as her own. As you can see by the photo at the right, I Do Not Agree! 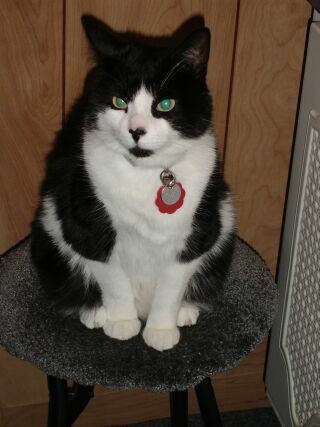 Note how green my eyes look as I Claim My Territory! I'm honored to welcome into my Fan Club a Very Important Dog. Wuffy is a remarkable dog owned by Gary A. Rohde. Wuffy's ability to sense what kittens need began when she brought four abandoned kittens to Gary, who soon discovered that Wuffy was able to work with sick cats and also with feral kittens that were considered unadoptable. Wuffy worked with hundreds of cats and kittens, with a 100% success rate, until her retirement. 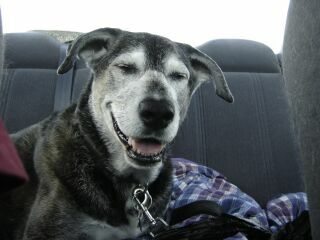 Now 15, Wuffy enjoys a life of leisure in Los Angeles with Gary. 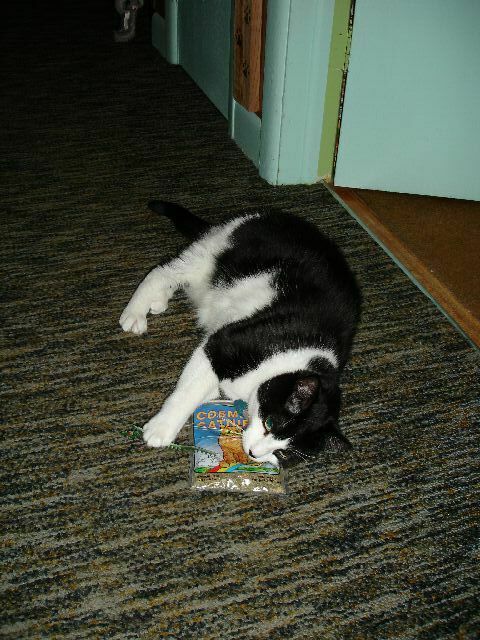 Wuffy was the subject of an award-winning article in Cat Fancy called, "Cats' Best Friend." 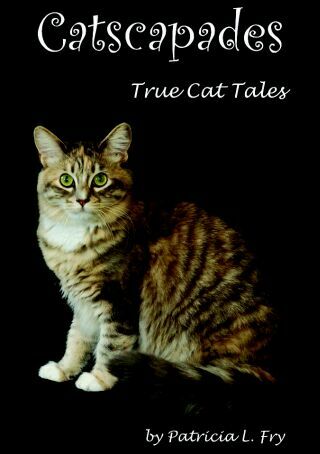 The author of that article, Kari Winters, worked with Gary in a Siamese rescue group, and wrote the book, Princess Fiona: My Purrsonal Story. The camera caught me napping beside the sign I make sure visitors see when they come to visit. I'm very friendly and polite, but it's important that anyone who comes into this house understands that I have First Choice of Where to Sit. I've already told you I have my Own Seat at the Great Canadian Theatre Company in the Irving Greenberg Theatre Centre in Ottawa. Bobbi often sits in my seat (A-13), but that's only because I give her Permission. If I wanted to, I could take the ticket and leave her home! My name is in the program as a Donor, and the tickets are in My Name. I send regular posters to GCTC for them to post on the bulletin board either in the box office or upstairs in the room where the actors and staff have their lunch. They all know me there, so if I should ever show up, I'm sure a Red Carpet will roll out for me! There was a Serious Situation here yesterday. Before I describe what happened, I have to explain that most of the closets in this house have sliding doors, which I have learned to open quite easily. I often hide my Little Fur Mice in various closets, so I go in and out of these frequently. But there are two closets with Difficult Doors, the kinds with knobs on them. One is in the hall, and it happens to be where Bobbi keeps the Catnip. If I'm close by when she gets something out of this closet, I reach in, grab the bag of catnip and try to chew it open until she takes it away. The other closet is where she keeps the Big Plastic Bin of extra cat food. I'm Not Allowed in there, either, but this morning, she needed something in that closet in a hurry, as she was rushing off to the launch of the 2010-2011 season at GCTC, and didn't see me go inside. She DID call me before she left, wondering why I wasn't in any of my usual morning napping spots, but I was sitting on top of The Big Food Bin, so I decided not to answer. Big Mistake. I ended up spending Four Hours in the closet. I thought, after a while, that maybe I was being punished for going in there in the first place. And of course I couldn't get the Big Food Bin open, so I had nothing to eat! You can be sure I won't do that again. Every so often I cuddle on the back of the living room couch with Tazi. Sometimes I wash him, or inspect his ears (which are always remarkable clean). I don't know if he appreciates this attention. The latest fan to join my Fan Club is an old pal, affectionately known as Der Uberhund. The reason for her big smile is that she lives with humorist Steve Pitt, who keeps Bobbi giggling with his almost-daily messages. I've never met any dogs in person, but I'm sure I'd get along with this friendly hound. Bobbi's April column for the West Quebec Post is called The PURRfect Pet, and is all about why a cat is the ideal pet for a senior. She refers readers to all the cat pages on our website. 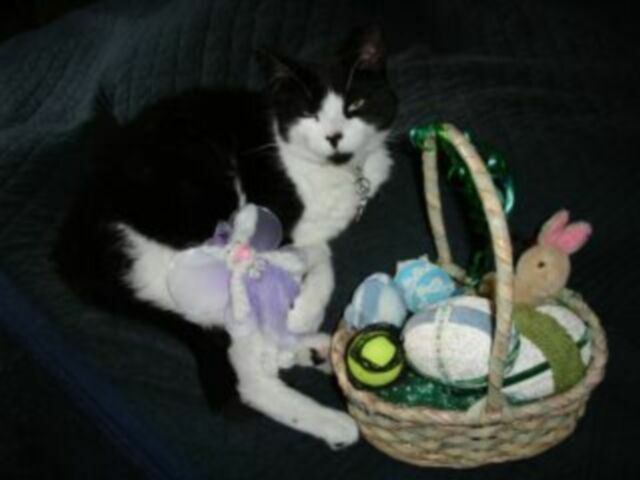 I've been posing for Easter photos, with mixed success. First, I don't understand the basket idea. It's too small for me to sit in, Bobbi objects to my playing with the colored cellophane grass, two of the eggs are much too big to play with, and she got annoyed when I managed to paw one of the smaller ones out of the basket and chase it around the room. Meanwhile, she waited with the camera, finally luring me back on the bed by the little bunny angel. She's really quite sweet, and Bobbi managed to snap a photo as I held her in my paws. Lily, the youngest member of my MEWSical Society, who began as an apprentice and quickly worked her way up, is taking her role as an Assistant Publicist seriously. She purred her way onto the cover of a new book, Catscapades, and even mentions the MEWSical Society in the chapter about her catscapade. Meanwhile, we're trying to PURRsuade Bobbi to follow the lead of her friends, Bob & Frances Walker, who transformed their home into a kitty paradise. The Cat House has been featured in magazines and on TV, and is described on their website and in their book. I have five windows in this house where I'm allowed to sit to look outside, but don't understand why I can't have a high wooden walkway, close to the ceiling, that extends from room to room. Don't I deserve that? In anticipation of Easter, our neighborhood bunny has hopped across the street to join our Fan Club. 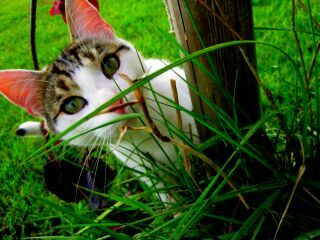 Omaste, already a member of our MEWSical Society, has also joined the Facebook group. She's been featured in a children's magazine in the U.K. Go to http://tinyurl.com/yd7bc9u to see the issue. Bobbi went to see a play at GCTC yesterday. I don't know pay much attention to her glowing descriptions of performances she sees, although I do know she usually sits in MY seat at the Irving Greenberg Theatre, which I purchased with My Own Money. It's seat A-13, and there's a placque on the back with My Name on it! GCTC is about to announce the 2010-2011 season, but there are two more plays left in this season, one starring the Fight Director from my MEWSical Society, John Koensgen. GCTC's exquisite new home is almost paid for, but they could use more donations, so if you want to support them, go to the website. You could buy Your Own Seat as well, if you wish! If you've been reading this blog since the beginning, you know that I respect all animals (even admire a few despite their non-feline shortcomings). My MEWSical Society has a parrot as its drummer, one of its members tried to encourage a chipmunk to join us (see Shooter's photo) and now there's further proof, as not only a llama, and alpaca and a couple of dogs have joined my Fan Club, but we just added two birds and about to welcome a bunny! I'll update this blog as soon as Bungie the Bunny joins us. 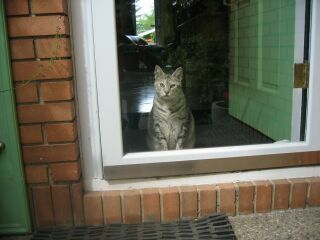 He lives across the street, with four lovely children who come to visit and love to pet me. Sometimes when I'm on Bobbi's lap, she wears a favorite pair of slippers. These were made by our friend, Violet, who lives in Sandy Lake. I've never met Violet, but I'm sure I'd really like her, because she trimmed the moosehide slippers with rabbit fur! I often wash this carefully before I settle down for my nap. Violet is a member of my Facebook Fan Club, and she also made the stunning wall hanging Bobbi took off the wall to place behind the slippers for the photo. It does make sense that I would wash the fur on these slippers. There's a story Bobbi tells about Mysti, a tortoise-shell part-Persian who was this household's Resident Feline before the first Simon Teakettle. Bobbi had a holiday party where the guests left their coats on the bed. Evidently, when some of them were ready to leave, they discovered Mysti nestled cozily among the furs, which were still slightly damp from her careful licking. The question on the Facebook page this week is what happens when your cat gets bored (and doesn't have any fur to wash). Tyler and I have chatted about this (via e-mail, as neither one of us can figure out how to use the phone), and he also reported this week on how he deals with Big Machines. His comments are HERE. Books selected for this highlight are then available in the archives (in the "Featured" section). I also just heard that TWO birds are joining our MEWSical Society fan club. Look for them on the Facebook page, and also HERE. Some fans join on our fan page because they don't belong to Facebook. 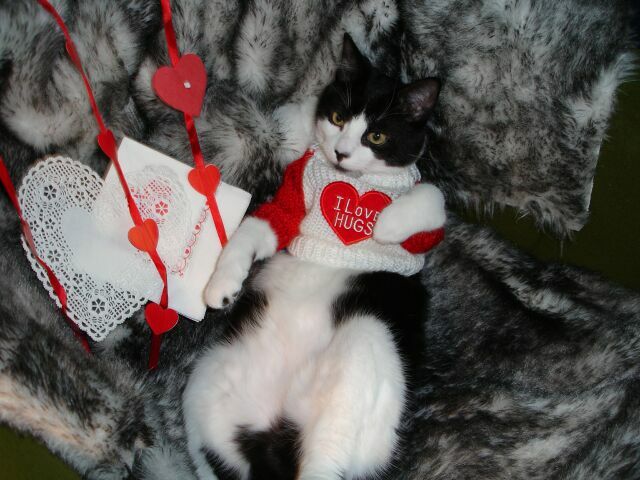 Tyler sent me another card from Benjamin, the traveling cat. Tyler and I refer to him as That Strange Purple Cat, but we're both impressed by how far he travels. The current card is from Mt. Fuji, and the message says he's meditating in order to achieve deeper wisdom. But Tyler and I think he's just napping. By the way, Tyler has asked for my advice because he's been trying to tell June that there's a mouse in the house. He and I agreed that Humans are Pretty Dense. June thought he was running around from room to room just for exercise! Have you checked our Fan Club page? There are a bunch of cats, a dog, and a llama, and there's a rumor a bird will be joining this week! The Fan Club page on Facebook has attracted 46 members in just a month. This is a Big Responsibility for me, and I want you to know I'm taking it Seriously. But there are many things clamoring for my Attention. I had to pose for my Valentine's Day photo, and remind her to turn the Christmas lights back on every evening, now that Winterlude has started. We're also preparing for the Olympics, as Bobbi follows the figure skating and I will have to help her Keep Score, hoping our Canadian champs win some medals. My favorite toy this winter is a furry spider. It used to hang from an elastic string on the door of the office, and I got great exercise jumping up to grab it. Eventually, the elastic broke, and I triumphantly carried it off to play with on the rug. This is even more fun than a mouse (well, almost!). I throw it up in the air, grab it with my paws, bounce it around the room, pick it up in my mouth and carry it from one place to another, and when I'm finished, sometimes I take it to bed with me so it can't escape. Bastet, the ancient cat goddess, has been in the news recently. 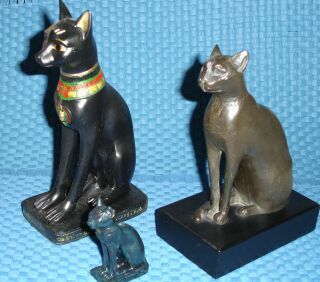 A large number of statues of Bastet were found in the ruins of a 2,000-year-old temple in the former city of Alexandria. Read about it HERE. As you can see, we have three Bastets in our household, to remind Bobbi that I'm descended from Majesty. It doesn't seem to influence how often she fills my food dish, however. This blog in linked All Over the Place, including at the site of the Pride Cartoon, an award-winning "reality" comic strip about the True Adventures of Crazy Johnny. That site is now up for an award, so be sure to go to thepridecartoon.com to enjoy the cartoon and vote for the site at: http://artistswanted.org/janeatthepride. The Very First Simon Teakettle made the decision that Our Brand would never become a cartoon. In fact, Simon I was quoted in The Bedside Book of Celebrity Gossip, published by Crown in 1984, when he denounced Garfield as one of those phoney cats "in loud orange suits." Simon was one of only three Canadians quoted in that book. A Michigan member of has introduced a bill into the U.S. Congress called the HAPPY Act: the Humanity And Pets Partnered through the Years. 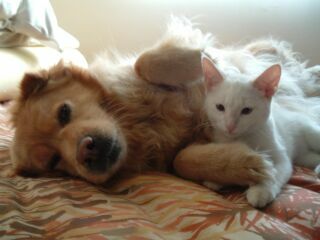 It proposes a tax deduction for pet care. This isn't such a silly thought, because many pets - cats particularly - don't receive proper veterinary care because their humans can't afford it. BIG NEWS! Lily has been Promoted! She worked so hard as an Apprentice to Aimee (publicity) and Jazz (piano) that she's earned two new titles: Publicity Assistant and Piano Assistant (and page-turner). We also have a FAN CLUB both on this site and on Facebook. Be sure to check it out. Do join, and encourage your friends to join, too. We hope to create a list of Fan Club Members (just first names), their locations, and, Most Important, the names of their cats. Since the youngest human in my MEWSical Society is 10 years old, we're hoping lots of kids will join. I received another fabulous post card from Tyler. This one shows Benjamin, the purple traveling cat, in front of Stonehenge. He looks rather startled, which isn't surprising, given the location. I know all about stones and rocks. Bobbi is Obsessed with stones. She's collected them since childhood, when she gathered them each summer from the rocky shore in front of their cottage in Indian Neck, Connecticut. 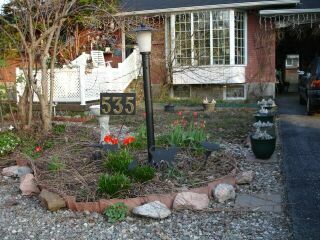 She wrote about them in Rocks, a prize-winning story that appears on Her Side of Mewsings/Musings, and even removed all the grass from both the front and back yards a few years ago, replacing it with stones. We have stones under the plants in the front bay window and the dining room window, under the table fountains, and even on various shelves. I was told those were Special Ones with exotic names which mean nothing to me. She has Other Idiosyncrasies, too, but I've been warned not to tell you about those! This is my new blog format, with photos on the right side. Do you like it? The first photo is of the adorable Lily, the only Apprentice my MEWSical Society, a bit awestruck by her First Christmas. The Sandy teddy is bigger than she is! This was my 4th Christmas, but the first one I really understood. I realized this year that I should go tell Bobbi late in the afternoon when our neighbors put their Christmas lights on, so she could switch on ours, too, and also that I Should Not Touch any of the wrapped packages under the coffee table. 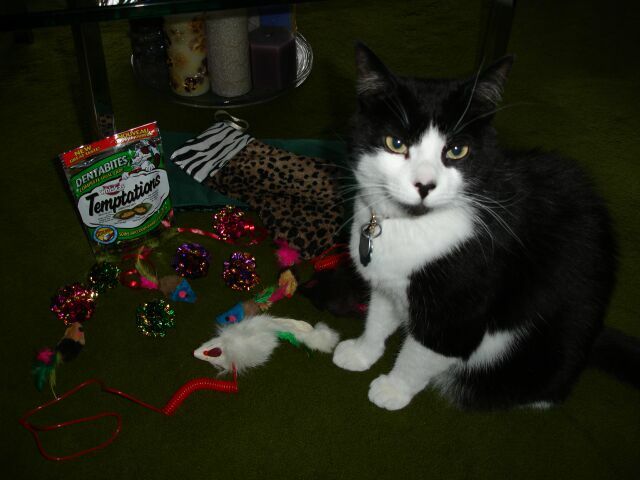 Here I am with some of the things in my stocking. I guard the White Mouse carefully, as I've had a succession of these, and they're my Very Favorites. Did you notice at the top of this page that you can now become A Fan of my MEWSical Society? Click on that link to find out how! 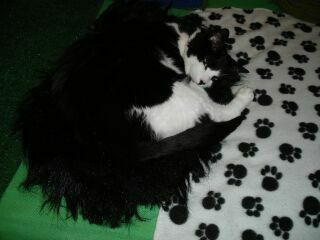 Here's MY fur bed, where I can be almost invisble because it's black, so I blend right in! 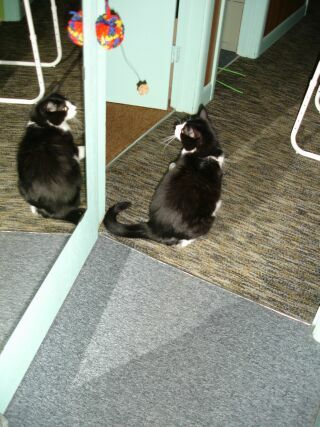 And here I am, keeping an eye on my reflection as I play with a toy hanging in the corner of the door. On Alert, watching out for Chain Saws! Here's the Lady Doga troupe. James, Laura and Simon with their cards. 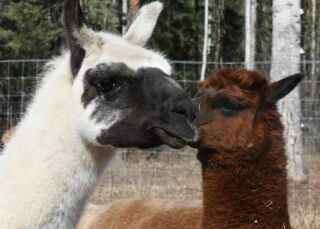 Pumpkin the llama with Hudson, the brown alpaca, disucssing our next Virtual Production from their home in the Northwest Territories. Willow (who plays The Bird in Peter & the Wolf) guardiug her front door. 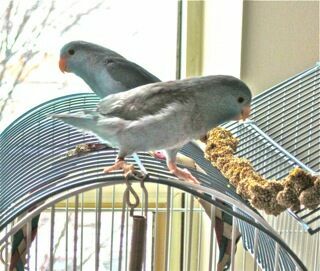 The newest members of our Fan Club include Bungie Quesnel (below) and Omaste. Prize to bat, then hide. 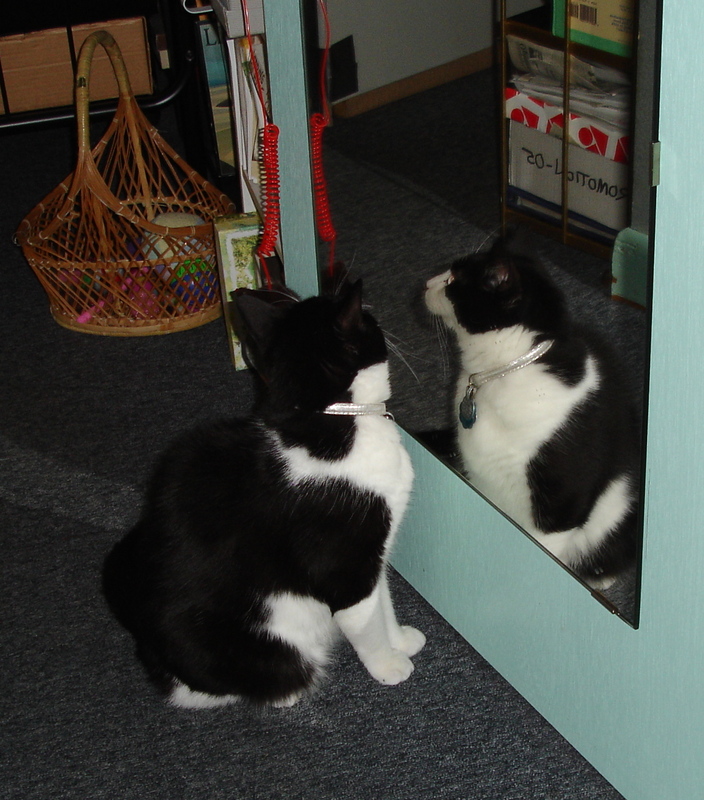 Sometimes I look in the mirror to see what Bobbi's doing in the office. 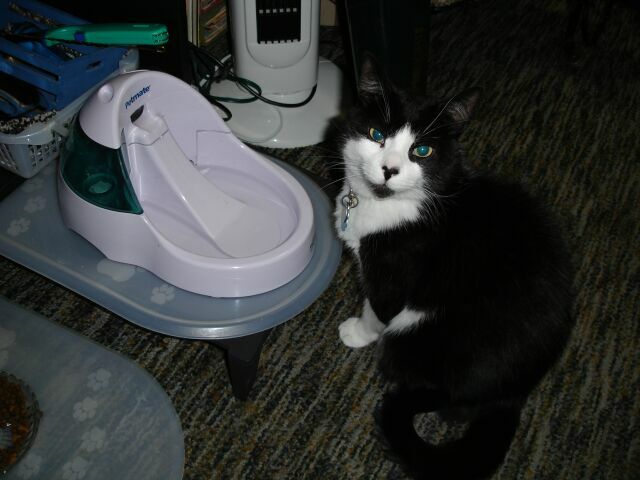 Terzo beside his water fountain.